human, plant and animal life in our borderlands region. our land for generations to come. Support Malpai Borderlands Group Inc. In July of 2010 the Board of Directors of the Malpai Borderlands Group voted to establish a scholarship fund, in the memory of former Malpai Board Member Rob Krentz, to assist worthy high school graduates in the Malpai Borderlands region with furthering their education. from 1994 to the present year. Please click here to read the newsletters. May 16, 2019 at 11:00 a.m. Proceeds from the auction will support students seeking college degrees in the Malpai Borderlands Region. If you would like to support the Rob Krentz Scholarship program; Please make your charitable donations to Malpai Borderlands Group Rob Krentz Scholarship program PO Box 3536 Douglas, AZ 85608. You may also donate a calf to be auctioned for the benefit sale. 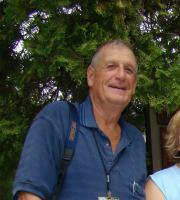 The Malpai Borderlands Group is saddened to report that Board Member Reese Woodling passed away on March 23rd. Reese served on the Board of Directors from 1998 until the present. He was due to step down from the Board this month at his request due to failing health. Reese served as Board Chairman from 2004 through 2010. A native of Ohio, Reese married his high school sweetheart Nancy Stocker, obtained a degree in geology and then moved west to work as a surveyor. In the course of his work, he met many ranchers, including the Metzgers of the Flying M Ranch near Flagstaff. Reese became enamored with cattle ranching and began working toward owning his own ranch one day. Along the way, he was a magazine publisher and high school teacher and coach. With a partner, he purchased a ranch near Cascabel, Arizona on the San Pedro River and began raising registered Brangus cattle. He later acquired another ranch in the Peloncillo Mountains in southwest New Mexico, which he also called the Cascabel. Reese’s cattle acquired a national reputation and he rose to become president of the International Brangus Breeder’s Association. Eventually, he bought out his partner and sold the San Pedro Ranch, concentrating on his New Mexico ranch. In 1998, he sold a conservation easement on the ranch to the Malpai Borderlands Group. After joining the Malpai Board, Reese became a very active member, often hosting meetings at his ranch, traveling to speak on behalf of the Group, and putting out a local quarterly newsletter. In addition to serving as chairman, he also headed up a committee that looked into the feasibility of possibly marketing branded beef. When the Malpai Group began a scholarship program to honor former board member Rob Krentz, Reese was the ideal person to run it. In addition to his years as a teacher, he had served as Chairman of the Arizona Cattle Growers’ Education Committee and chaired its Research and Education Foundation, during which time he ran their scholarship program. Under Reese’s careful attention, the Krentz Scholarship has been very successful, so far helping eight local students further their education. Reese and Nancy have also given scholarships to three students through their own fund which is run through Malpai. Reese Woodling looms large when one looks at what has made the Malpai Borderlands Group what it is today. But more than that, he will be remembered as a good friend and as someone who worked tirelessly and unselfishly to help his fellow man. We are a grassroots, landowner-driven nonprofit organization attempting to implement ecosystem management on nearly one million acres of virtually unfragmented open-space landscape in southeastern Arizona and southwestern New Mexico. The Malpai Borderlands area includes the San Bernardino Valley, the Peloncillo Mountains, the Animas Valley and the Animas Mountains. It is roughly pyramid shaped, with the base of the pyramid beginning just east of Douglas, Arizona along the Mexican Border to just west of Antelope Wells, New Mexico. The apex is just south of Animas, New Mexico. With elevations ranging from 3500 to 8500 feet, the Malpai is a diverse area of mountains, canyons, valleys and riparian corridors. Several rare, threatened, and endangered plant and animal species are found here. It is the only place in the U.S. where Gould's turkey and white-sided jackrabbits occur naturally. It is also home to popular big-game species such as Coues deer, mule deer, pronghorn and Desert Bighorn sheep. Perhaps the most remarkable feature of this huge landscape is that fewer than 100 human families reside on it. Many of the families who live here have been here for generations. Except for two small wildlife preserves, this is cattle ranching country. As ranchers, we have been concerned about a key resource we depend on for our livelihoods and way of life - the diminishing quality of grasslands for grazing. Fragmentation of the landscape, beginning with the subdivision of some ranches in our area, has also been a looming threat. We formed a nonprofit organization to bring ranchers, scientists, and key agencies together, and today the Malpai Borderlands Group now carries out a series of conservation programs and activities, including land restoration; endangered species habitat protection; cost-sharing range and ranch improvements; and land conservation projects. We invite you to explore our website and learn more about our efforts.